It always surprises me how many people avoid lentils altogether out of the common misconception that dried beans and legumes are difficult to prepare. They are actually a breeze to cook, and infinitely flexible in the flavor department. Lentils are inexpensive tasty powerhouses that offer an impressive amount of iron, zinc, potassium and magnesium along with a whopping 18 grams of protein per cup. Because lentils aren’t a complete protein, I always recommend serving them with brown rice to reap all of the nutritional benefits. Want to give your lentils some star power? While they are cooking, sauté chopped onion, garlic and sweet peppers in some olive oil until al dente, and toss in some fresh, chopped herbs like parsley and oregano. When the lentils are done (don’t strain them), stir everything together and serve the lot over brown rice, with a drizzle of balsamic vinegar. As I mentioned before, lentils are a great addition to a salad. Toss them with some barley, goat cheese, and fresh, raw veggies and you won’t believe how you have lived so long without them. They are also perfect as a soup. You can either start with more liquid or add broth after the lentils are cooked. I love to use my stick blender to puree some of the lentils when I make a soup. This creates a luscious, creamy broth. And speaking of creamy broth, now that the weather is starting to turn cooler, I decided to share one of my favorite chicken soup #recipes this month as well. 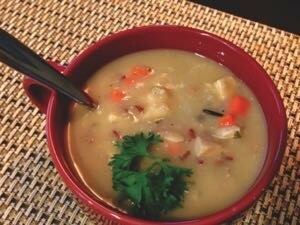 It never hurts to have a few comfort food recipes in reserve, and this creamy chicken and wild rice soup certainly fits the bill. You don’t have to be under the weather to crave this stuff, though. It’s like a big, warm hug on a cool night! And don’t feel limited by the vegetables I use; add whatever makes you happy. Zucchini, squash, even leftover roasted vegetables will taste great and make it your own custom creation. Late this month the long, hot summer will give way to fall, and I for one will be happy to see it arrive. To help you get ready for those nights when you need a sweater for your evening stroll, we are going to dive into two comfort food favorites: lentils and chicken soup. Both are easy to prepare, low in fat, and great as leftovers. In fact, I often make a double batch just to make sure I’ll have enough for lunch the next day.